Get Ready to Learn! Cathy Bollinger, a much-loved singer-songwriter who also happens to be a Music Therapist, has written these tunes for use in today’s everyday world. These multisensory songs, ranging from snazzy to jazzy, will help your child and/or student have success in school, through her children’s music: repetition of basic living skills, those of listening, following directions, using friendly manners towards others, focusing on their work, transitioning from one activity to another, and lining up. Plus, TWO bonus tracks are included for a quick reminder or cue to line up or to change activities. These songs are great for schools and for homeschools too! NOW AVAILABLE! Great for new TEACHER'S GIFTS! On behalf of the Parents' Choice Awards Committees, it is my great pleasure to let you know that Ready to Learn! Songs for School Success has been designated a 2007 Parents' Choice Award Winner. The Parents' Choice Awards program received many strong entries this season; Ready to Learn! Songs for School Success is among the small percentage selected to receive a Parents' Choice Award. I hope this brief but hearty congratulations will suffice until you receive the Parents' Choice Awards certificate honoring your work. Cathy Bollinger's toe-tapping album emphasises the importance of children learning positive attitudes and habits in school. Vocal and instrumental performances are very good and the band performs on a variety of instruments, including guitars, piano, trumpet, sax, trombone, drums, percussion, fiddle, ukulele, harmonica, djembe, and more. A number of children also add their sweet voices to the musical styles, such as calypso, contemporary pop, country, folk, jass and rock. The songs give advice on how to behave in school---be attentive and focused, follow directions, raise hands, clean up and more. "Get Ready and Follow Directions" uses motifs from Ponchielli's "Dance of the Hours", also popularized by Allan Sherman as the tune for his song "Hello Muddah, Hello Faddah". The album will be especially useful in classroom settings. In our second grade class, we have adopted Ready to Learn as our morning music. The children love so many of the songs, but always ask for Wiggle and Freeze. The teachers love Get Ready and Follow Directions, Two Words Please and The Transition Song (It's Time to Do Something New). Line Up is another favorite of everyone! 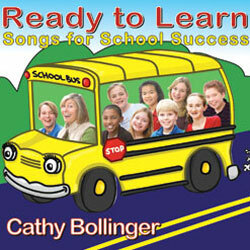 "Cathy Bollinger brings great teacher aids to the classroom through Ready to Learn: Songs for School Success. Her songs and activities are easily adapted to fit different classroom and student needs." Do you wish you hadn’t? Say “ I’m sorry. I made a bad choice. You’ve heard the whole direction? A word or correction ? Good choice or bad choice? What choice can I make? What steps can I take? What could you do if this happened to you? What could you think to say? She’s talking kind of fast Arachnids? I’m mad! What can I do? Mrs. Hickleman how do you make the letter G? Sitting by himself without a friend .